Heat the oil in a large saute pan over medium-high heat. Add the mushrooms and cook, stirring occasionally, until browned and all the liquid has evaporated, about 5 minutes. Season with 1/4 teaspoon of salt. Stir in 1 1/2 cups of the tomato sauce and simmer for 2 minutes. In a medium bowl combine the ricotta cheese, spinach, egg, the remaining 1/4 teaspoon salt, a few turns of pepper, and nutmeg. Spread 1 cup of tomato sauce on the bottom of a 9 by 12-inch baking dish. Spread about 2 tablespoons of the ricotta mixture onto a lasagna noodle. Top with about 1 1/2 tablespoons of the mushroom mixture, roll the noodle and place it into the baking dish. Repeat with the remaining noodles. 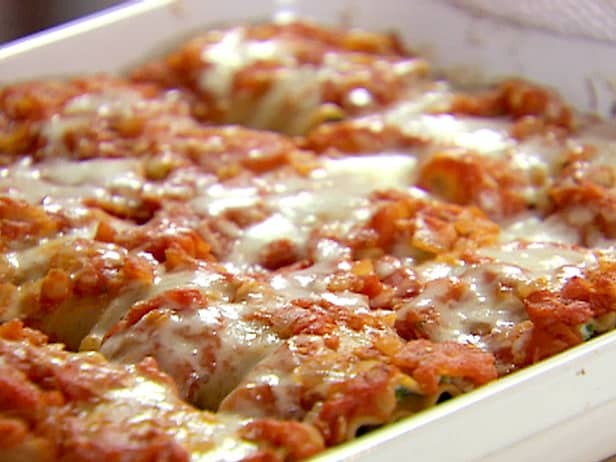 Spread the remaining 1 1/2 cups of sauce over the lasagna rolls. Top with grated cheeses, cover loosely with foil, and bake for 45 minutes. Uncover and bake for 15 minutes more. In a large pot, heat the oil over medium heat. Add the onion and cook, stirring occasionally, until soft, about 5 minutes. Add the garlic and cook for 2 minutes longer. Add the remaining ingredients and cook, uncovered, stirring occasionally, until thickened, about 30 minutes. Season with salt and pepper, to taste. Two questions – what temp to cook? and I got confused when you started talking about onions towards the end but I did not see that in the recipe. Help! Otherwise, this is my 4th one trying and we love them! Thanks, I have added this and the homemade pizza dough to my “recipes to try” folder.